Each year, rental agencies sell off their vehicles in order to maintain low mileage and newer vehicles in stock. When shopping at used car dealerships in Mesa, learn what you need to know when you come across this option. Home / Blog / Should You Buy a Used Rental Car? So what happens to rental cars once they pass on to the other side? Every year when car rental agencies are busy buying up each brand’s newest models, they’re also getting ready to sell off their oldest vehicles to used car auctions and lots. Sometimes these cars will even find their ways to used car dealerships in Mesa! If you’re in the market for a used car, check out this option when shopping around and keep in mind some of the expert Auto Action AZ best practice tips for inspecting any previous life rental car. Retired rental cars generally have between 20,000 and 40,000 miles clocked before heading to used car dealerships to be publicly sold. When rental car companies will sell directly to auctions and bought my used car dealers are often listed as “program cars.” Keep your eye out for that term when browsing used car dealerships in Mesa! Rental car companies like to keep their fleet of vehicles in top shape. Think about it: when you rent a car, are you going to rent one with dents or tears in the interior? No! Many rental companies have in-house mechanics and maintenance crews that fix any wear and tear that may be added to a vehicle during a rental period. Although you may never know any of the finer details about a car’s history while in the hands of a rental company, you may still be covered by its original warranty depending on how old the car is and how many miles are on it. Sometimes it may be the case that manufacturer warranties are not passed from owner to owner, but it’s always worth asking your used car salesperson. 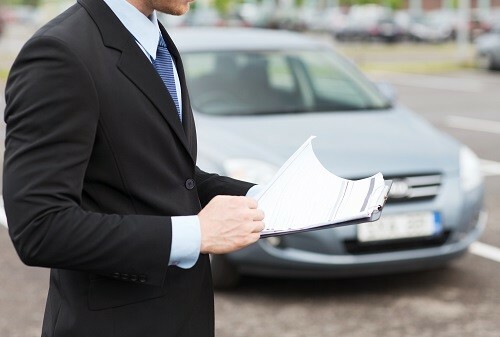 When browsing used rental cars or any used car in general, be sure to do your own research and make a note of the average price, mileage, and market value of the vehicles you’re looking at. It’s good to do some comparative research to make sure you’re getting the best value. Is the straight from the rental lot incentive actually worth it in the long run? It depends case-to-case and it’s up to you to do your homework if you’re looking to save some time and money. Are you in the market for a used car? When browsing used car dealerships in Mesa, be sure to stop by your local Auto Action location and speak with one of our experts about what our vehicles have to offer that other lots don’t. To learn more about the advantages of buying used rental cars, give us a call at 602-345-8000 or fill out the form to your right.